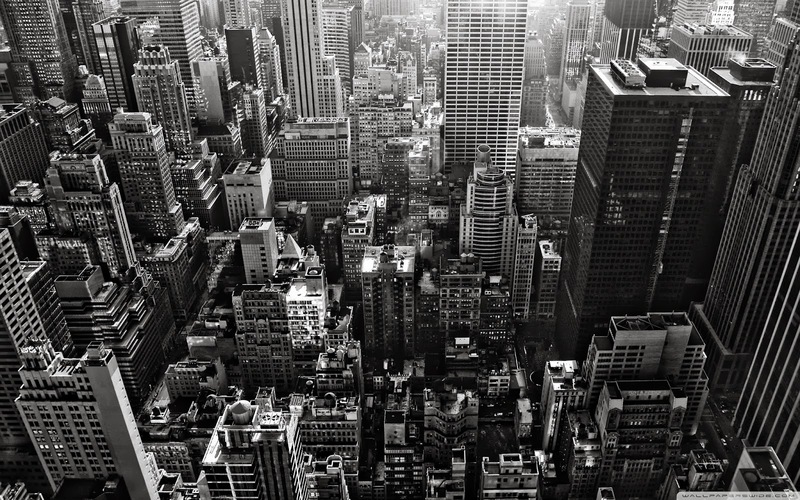 Canada's real estate market most overvalued in the world?! Really? Real estate prices in Canada are the most overvalued in the world, according to a new study from Deutsche Bank, which estimates homes in the country are valued 60 per cent too high. Some economists here have crunched their own numbers and come up with results similar to those of the German bank. This article appears in the September edition of the Financial Post Magazine. At Al Premium, the gleaming new 75,000- square-foot grocery store at Eglinton and Warden, bags of Filipino jute leaves share the aisles with sacks of Vietnamese glutinous rice flour, Caribbean spices and Halal meats. The cafeteria counter transitions seamlessly from shawarma to mutter paneer to pho to dim sum, and the bubble tea station, staffed by a teenager in a hijab, abuts the espresso machine. The store caters to the mind-boggling diversity of the westernmost bit of Scarborough, which fulfills Toronto’s promise as a multi­cultural city in a way that no downtown neighbourhood has in decades—nearly half of the residents here are visible minorities. The diversity is vividly realized at the annual three-day Taste of Lawrence festival, for which the local BIA manages to close off a six-lane suburban arterial to traffic (downtowners would be surprised at how many people opt to walk). In contrast to the hectic excitement of the main streets, all is placid on the inner residential lanes, where pretty post-war bungalows on perfectly kempt lots go for less than $500,000. There are even a few reminders of the mid-1850s village that used to stand here, like the old Anglican Church of St. Jude in Wexford and a copse of gnarled, hundred-year-old oaks and sugar maples that somehow survived clear-cutting at the top of Wexford Park. Further north on Pharmacy Avenue is Wexford Collegiate School for the Arts, the east end’s magnet for budding singers, actors and artists, whose alumni include sculptor Shary Boyle, Canada’s representative at this year’s Venice Biennale; and Degrassi’s Nina Dobrev—and yes, the school’s “Gleeks” recently sang an earth-to-orbit duet with Chris Hadfield. The snaking paths that connect the remains of the great and good in Mount Pleasant Cemetery are also some of the city’s most picturesque running routes, passing by fountains, gardens and hundreds of rare trees from around the world. It’s because of those trees that the midtown neighbourhood in which the cemetery sits has the city’s densest, plushest canopy. 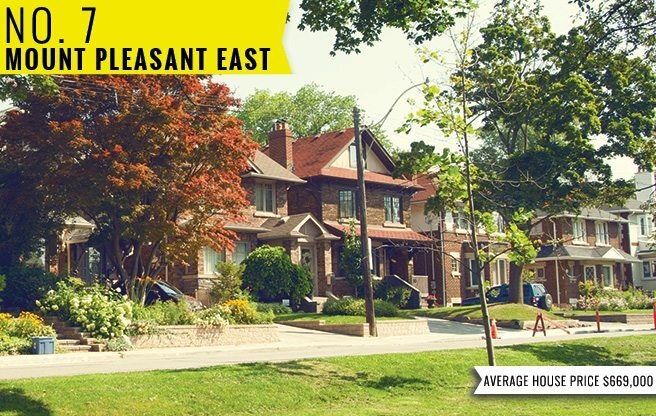 Unlike renter-dominated Mount Pleasant West next door, Mount Pleasant East feels like a small town full of professionals drawn by the quiet, leafy streets and central location. Housing stock here is a mix of brick semis and detached homes from the 1920s, with the occasional mansion and modern glass and brick stunner thrown in. One of the most attractive streets is Belsize Drive, which is split in two by a linear park, beloved by dog walkers, called Glebe Manor. Homes don’t often come on the market, and when they do, bidding wars are the norm: one old semi recently went for $760,000—$80,000 over asking—after 200 visitors and seven bids. 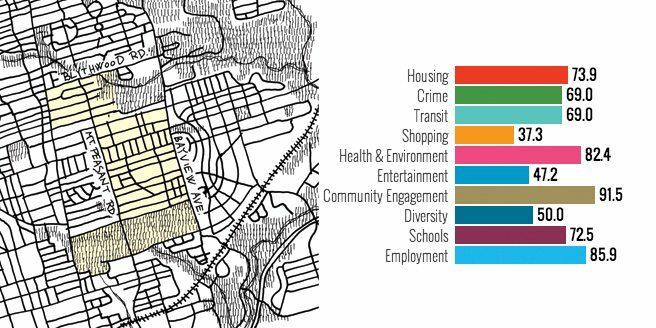 Of the two retail strips that flank the neighbourhood, Davisville Village, on the west side, is more interesting and varied than Bayview. Up the street is Mabel’s Fables, one of the city’s best children’s bookstores. The strip is also home to a 125-year-old camera club; two of the last small-time neighbourhood cinemas, the Regent and the Mount Pleasant; and three surprisingly good bistros, Célestin, Jules and Mogette, that fill up each weekend with families out for brunch. 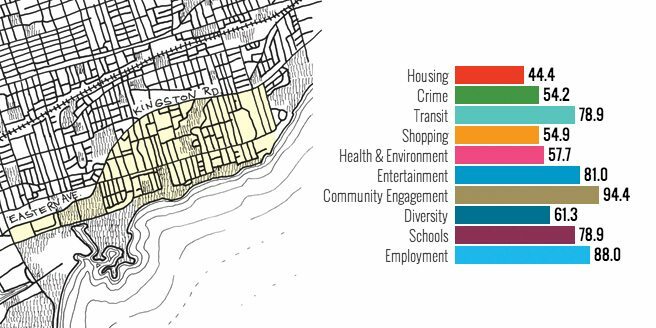 The Beach is the only segment of Toronto’s waterfront that lives up to its enormous potential as a place to live and play. That’s why the 3.5-kilometre boardwalk is invaded every weekend by pleasure-seekers and why a detached home on one of the picturesque streets by the water seldom goes for less than a million dollars. 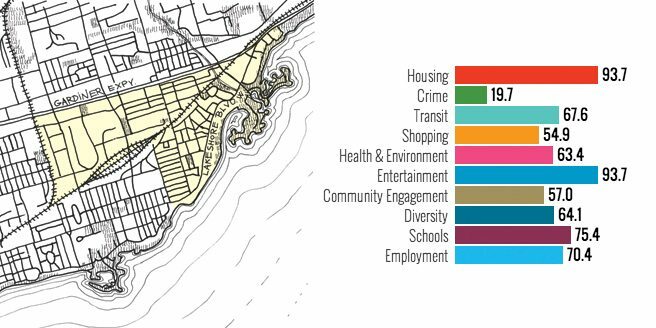 It’s also why the word “Beach” has been climbing steadily uphill from the lake, first transforming the gracious homes north of Kingston Road into the Upper Beach and then spawning Beach Hill just south of the train tracks, the latter’s dubious connection to sand and spit notwithstanding. 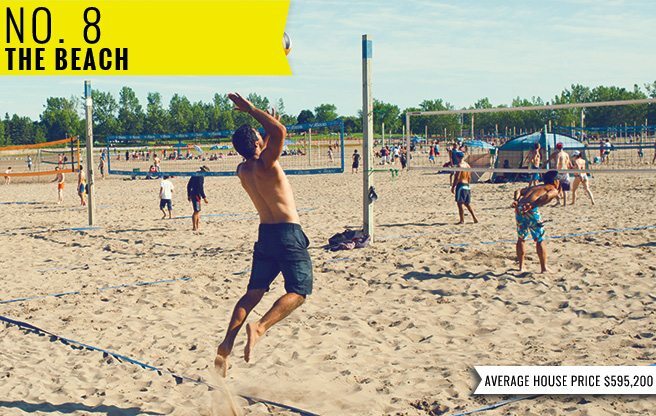 Residents of the actual area tend to stay away from the crush of beach volleyball and kitesurfing at Ashbridge’s Bay Park, sticking to the quieter eastern stretches or relaxing over a pint at the Balmy Beach Club, a relic of the days when the shoreline was filled with amusement parks. The styles of the houses here are more eclectic than in just about any other old Toronto neighbourhood. By the water, tiny Victorian summer cottages mingle with low-slung apartment buildings and larger houses from the ’20s and ’30s, some featuring kitschy lakeside resort details like porthole windows. In the 1990s, Greenwood Raceway was torn down and replaced with Woodbine Park, which gets taken over by a different festival every summer weekend (Ribfest, the Muhtadi International Drumming Festival, the jubilant Beaches International Jazz Festival). To the east, there’s a dense New Urbanist development laid out on six streets, bringing new waterfront housing to hundreds of families in the area for the first time in decades (even if the trees have yet to fully grow in). 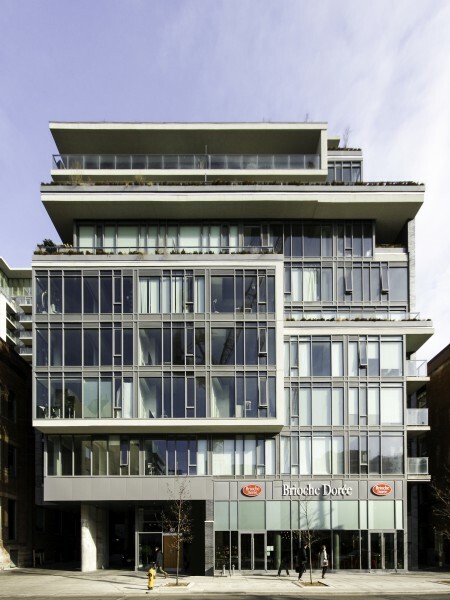 Beach residents are famously averse to new development, and the first modern mid-rise condos are only now appearing along the fiercely protected Queen East retail strip. 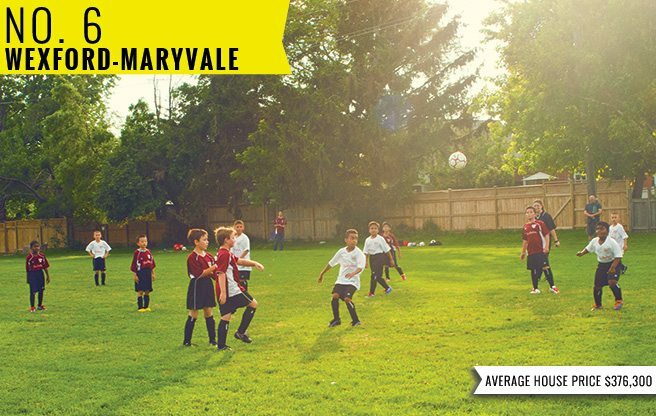 Ask Mimico residents about their neighbourhood, and they’ll get a starry, faraway look in their eyes as they rhapsodize about their little commuter village by the lake. It’s easy to get swept up by the small-town feel of neighbours looking out for each other’s kids, or by the tiny waterside parkettes at the end of the streets, some with chess tables. Or, for that matter, by the bucolic cottages and bungalows on generous plots that go for about the same as a condo downtown. Every weekend, cyclists take to the lakeside trails and dog walkers brush by joggers in Mimico Waterfront Park, a new kilometre-long green space with pockets of wetland habitats, and boardwalks along the shore that connect to the waterfront trail. The Humber Bay Shores area just to the east is quickly filling up with 38- to 66-storey towers whose meretricious names evoke Miami Beach—Ocean Club, Jade, Eau du Soleil—but Mimico itself has so far resisted that kind of intensification. A revitalization plan recently approved by city council caps off new Mimico buildings at 25 storeys while sprouting parkland and increasing access to the lake (it also allows developers to replace the crumbling apartment blocks from the ’50s and ’60s). After years of planning, GO trains are now running every half hour to Union Station (it’s a mere 15-minute jaunt for Bay Street–bound commuters), and new businesses are slowly creeping in, like FBI Pizza, a delivery outfit run by Queen Margherita Pizza alumni. Whatever real estate agents might say, the area is a long way from becoming the western Beach. The pace is less harried here, there’s not nearly the density of cutesy restaurants and shops, and Starbucks has yet to invade. And that’s precisely how Mimico residents like it. 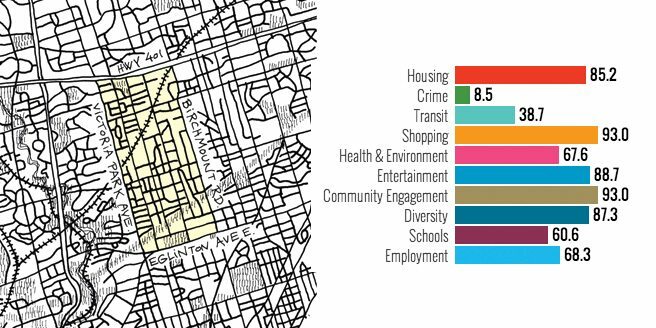 In a city with so many great pockets, and many more improving faster than you can say gentrification, the competition for the title of Number One Neighbourhood is cutthroat. 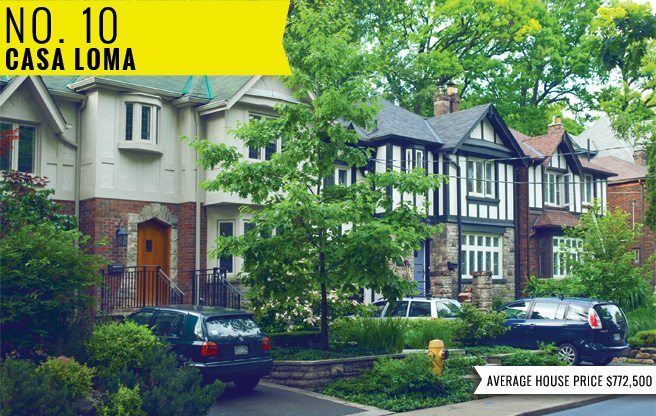 In a hot Toronto market, should I price my house high or low? Question: I'm planning to sell my house soon. From what I've seen in the news, the summer market was unexpectedly strong - should I be "aggressive" in pricing my home? Answer: The summer market in Toronto was indeed unexpectedly strong – the number of resale homes and condos sold in July 2013 was up 16.4 per cent over the same period last year. Many experts are predicting this momentum will continue into the fall market despite steadily rising interest rates. 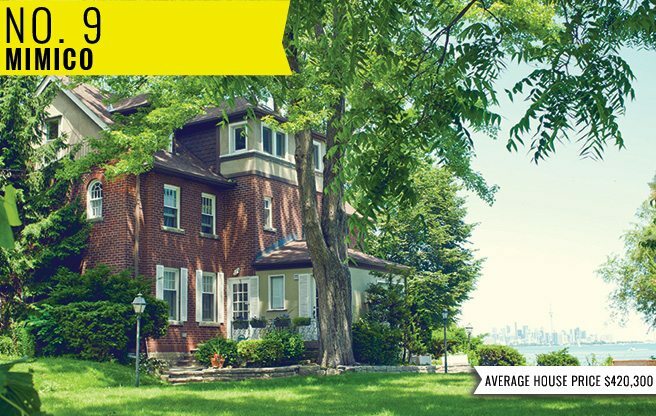 Last fall, homes in high-demand areas like the Beaches, Riverdale, East York, High Park and Leaside had sale price to list price ratios of 100 to 102 per cent. That means they sold for asking or more than asking in the majority of cases. If you are worried about underpricing and leaving money on the table… don’t worry. In my experience, the market itself always works in dictating fair market value. If you’re in a hot area, a fair and even lower than expected price may even drive a bidding war to your benefit. The houses are the very definition of “as is.” Most are dilapidated and untidy – some are downright squalid. And almost all of them have sold well above the asking price with a handful of bidders competing for the chance to rip up the tile floors and tear out the old bathtubs. The properties are in the portion of the Toronto Community Housing Corp. portfolio designated for sale, two at a time. TCH plans to sell 68 vacant properties in 2013 and 2014. Last week, for example, a rowhouse on Booth Street in Leslieville drew 11 offers. The house – listed at $499,000 – has crumbling plaster and a sagging porch, but it offers a coveted location, a private backyard and parking. The winning bid was about $580,000. Most of the buyers are renovators and flippers who undertake a thorough overhaul, then resell the property, says real estate agent Leonard Fridman of ReMax Hallmark Realty Ltd., who has taken on the task of selling more than 40 of the houses. Mr. Fridman and his team of agents are listing two properties each Monday, with an offer night scheduled to follow a flurry of open houses and appointments. This week’s houses are in the east end, at 176 Eastwood Rd. and 93 Empire Ave. Potential buyers are expected to swarm through at the open houses this weekend. “They tend to be in urban pockets that are gentrifying and continue to gentrify,” says Mr. Fridman of the houses in such neighbourhoods as the Beach, Riverdale and High Park. 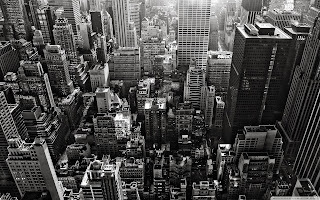 Mr. Fridman, who specializes in buying and selling investment properties, has a large database of more than 2,000 potential buyers. He sends out an e-mail each week to let them know which houses are coming onto the block. He also lists them on the multiple listing service of the Toronto Real Estate Board. TCH spokeswoman Sara Goldvine says Toronto’s social housing agency has all of the properties appraised to ensure that they are sold for fair market value or above. TCH is using the proceeds to offset a repair backlog on its remaining properties that stood at $750-million in 2012 but is expected to swell to $1-billion by 2015 without new sources of funding. Ms. Goldvine confirms that the six deals that have closed so far in this batch – with approximately 10 more slated to close in the coming weeks – have produced bounteous selling prices. “The sales are going better than expected,” Ms. Goldvine said. Real estate agent Nicholas Bohr, who is working with Mr. Fridman on the sales, says the builders and renovators who are buying them like the fact that they’re not paying anything extra for embellishments. Mr. Bohr, like everyone on the Fridman Elkind team at ReMax, is an investor himself. Mr. Bohr says some potential buyers are young couples and other people looking to get into a single-family dwelling. In many cases they find the scope of the renovation just too daunting. But he thinks some buyers could end up with a desirable house in a sought-after area if they are willing to put in some time and effort. The number of $1 million-plus condos for sale in Toronto has reached such “shocking” levels, it would take about 20 months to sell them all given current demand, more than four times what it would take to clear the current inventory of more conventional condos. What’s even more worrisome is those numbers don’t include “shadow inventory,” which could easily exceed the number of high-end condos that were listed for sale on the Multiple Listing Service as of the end of June, says Toronto realtor Andrew la Fleur who did the math recently on behalf of an investor. That shadow inventory includes units that have yet to sell in five-star hotel projects like the Trump International Hotel & Tower, Ritz-Carlton, Shangri-La and Four Seasons, all of which have hit the market in the last two years. Also part of that great unknown are pricey penthouses still sitting empty in dozens of newer condo projects, especially in the downtown core: Developers don’t like to dump too many of their unsold units on the publicly accessible MLS system all at once, for fear it can make the project look bad and undercut prices. In the first six months of this year, there were 145 condos listed on MLS for $1 million or more, says la Fleur, who was shocked by the numbers when he started delving into the high-end market recently on behalf of an investor who wanted to know if they stood to make more money buying one pricey property or two or three cheaper condos. Only 42 of those $1-million plus units actually sold, an average of seven per month, says la Fleur. That equates, in key real estate market terms, into a 20-month supply. It was even higher, 25 months, in tony Yorkville, much to la Fleur’s surprise. That’s more than four times the three to five-month supply of more conventional condos that were for sale in the first six months of 2013. “It’s very crowded out there,” says la Fleur, who found prices have remained flat, or even slumped, for folks who bought into many of the five-star hotel projects before they were built. He believes it could be at least three years, and perhaps as much as a decade, before investors in that sector really start to see gains. While prices have indeed been flat, there hasn’t been the slump many had expected now that all those five-star offerings are up and open, says Shaun Hildebrand, senior vice president of condo research firm Urbanation. In fact, months of supply in Yorkville has always run about twice that of the conventional condo market and it’s just going to take time for all these new units to find buyers, he added. Wealthy buyers are still looking at Toronto, says Ross McCredie, chief executive officer of luxury realtor Sotheby’s International who sold his $2 million condo in the Four Seasons last spring to a Hong Kong buyer. In fact, dozens of condos in the Ritz, Shangri-La and Four Seasons are already being rented out, either by choice or because investors couldn’t find buyers. Rents are running more than $3 to more than $5 per square foot. That translates into a mere $6,000 a month for a 1,600 square foot unit at the Ritz. Canadian home resale prices increased in July, boosted by strong gains in Hamilton and Toronto. According to the Teranet-National Bank Composite House Price Index, which is a weighted index of 11 cities across Canada, prices increased 1.9 per cent last month from a year earlier. Toronto saw gains of 3.4 per cent, while Hamilton was up 6.7 per cent. “Hamilton is an up market by any respect,” said National Bank senior economist Marc Pinsonneault. “The only weakness we see in Toronto is that there many unsold new condos, including those on pre-sale and under construction. “That’s the only part of the Toronto market that you can say is weak,” he said. On a monthly basis, the Teranet-National Bank House Price Index rose only 0.7 per cent in July, weaker than the average increase of 1 per cent seen over the last 12 years. On a nation-wide basis, home prices have only increased by 1.9 per cent, in part because of a price correction that began in September 2012 and only ended a few months ago, Pinsonneault said. Even if sale prices are lower than usual in August and September, based on the last year’s drop, home price inflation will still rise due to base effects. However, Pinsonneault anticipates sales are likely to cool in the latter of the half of the year because Canadian banks began to raise interest rates on new mortgages in June, which will have an effect on affordability. “It will be the worst since the start of the last recession,” he said. The federal government also instituted new mortgage rules, which went into effect last July, making it tougher for home buyers, but affordability questions were mitigated by low interest rates. Buyers holding pre-approved mortgages will able to take advantage of better mortgage rates, so the impact on home sales figures may not be felt until later in the year. Canada’s two most expensive cities for housing continue to defy warnings that their markets are poised to crash. Both Vancouver and Toronto saw sales surge in July, outpacing expectations and further confusing buyers unsure of when the right time is to get in. Sales in Toronto’s housing market were up 16 per cent in July compared to the same month last year, while Vancouver, already the most expensive city in Canada in which to own a home, saw a surprising 40-per-cent jump. The comparison is to July 2012, when the government last tightened mortgage rules. Economists say that could have scared off a few buyers back then, creating a larger gap between the two time periods. “However, the degree of the recovery in home sales over the last two months has beaten our expectations,” says TD Bank economist Diana Petramala. Still, Petramala is expecting some “pay back” in August and September, as rising mortgage rates threaten to mute buying activity. “The recent strength … is likely to prove temporary,” she says. The Toronto Real Estate Board, is claiming it’s a “seller's market” with sales growing faster than listings. It says July sales were the third best on record, and the strongest since July 2009. Average home prices in Toronto rose 8 per cent in July to $513,246, compared to the year before, "reflecting tighter market conditions, " TREB said. In Greater Vancouver, July was the highest selling month of the year and the highest for the month since 2009. “Demand has strengthened in our market in the last few months, which can, in part, be attributed to pent-up demand from the slowdown in sales activity we saw at the end of last year,” says Sandra Wyant, president of the Real Estate Board of Greater Vancouver (REBGV), who describes the market in the region as stable. The benchmark price for homes in the Greater Vancouver area were $601,900 for July, a drop of 2.3 per cent compared to the same time last year, but an increase of 2.3 per cent over the past six months, the REBGV says. TD says the surge in buying is also likely due to homebuyers with a pre-approved mortgages jumping into the market to take advantage of record-low interest rates. The bank cites a correlation between interest rates and homes sales where, for every 1-per-cent increase in the 5-year government bond yield, existing home sales tend to immediately increase by 6 per cent, “supporting the view that as interest rates begin to rise, households with pre-approved mortgages jump into the market,” says Petramala. On the flip side, higher interest rates drive sales lower. TD says a 1-per-cent increase in interest rates leads to a 1-per-cent decline in home sales. A recent report from economist Will Dunning Inc. also shows the impact rising interest rates would have on the Toronto resale housing market in particular. Dunning, who is also the chief economist for the Canadian Association of Accredited Mortgage Professionals (CAAMP), found that a half-point rise in mortgage rates would cause home sales to drop by nearly 9 per cent between 2012 and 2015, with prices dropping by 2.6 per cent to about $486,000, down from $499,000. If rates were to rise by 1 per cent, Dunning estimates a 15-per-cent drop in sales between 2012 and 2015. Prices would fall by nearly 6 per cent, to an average of about $470,000. “Now, with the recent sharp jump in interest rates, buyers are rushing into the housing market to take advantage of pre-approved mortgage rates,” Dunning said. While surprising on the surface, the sudden surge can be explained by a few factors: This year’s strong July is being compared to last year’s weak sales figures. A year ago the market was softening significantly, especially condo sales, in the wake of tougher mortgage lending rules that had been imposed that month by Ottawa, sidelining many first-time buyers. Weather may have also be a contributing factor: The spring market was pretty much a wash-out across the GTA this year as the cold, wet weather kept buyers at bay. Many realtors had been anticipating that pent-up demand could see an extension of the spring market into the summer, and perhaps even into this fall.